I wrote one of my first blog posts on the plane ride here so it seems appropriate to write one on the way back. Everything was surprisingly painless and I thankfully figured out a way around the $200 fee for a second bag that I got charged for on the way here. We got back to Stuttgart from Berlin on late last Saturday night. On Sunday, I packed most of the day and had one more homemade family dinner with everyone who was left and played a game of poker before going home to pack and clean more. On Monday, I continued the same draining process, paid the last month’s rent, and closed my bank account. A part of me hurt a bit when the lady cut up my German debit card. Then Chris and I headed to the schloßplatz, which translates to “castle square”. It’s in the center of downtown Stuttgart, where my buddy took me on my very first day. Chris took the same exact picture of me that my buddy did 5 months ago, and it’s crazy how different the two pictures are. Afterwards we laid in the park while we waited for our friends to arrive and then headed to a biergarten for my last dinner in Stuttgart. It wasn't a very German meal, but I did have my last radler, which are apparently sold in the states as well but they won't be the same. We headed back to our dorms to play a game of Settler’s, and at the end of the game were the inevitable goodbyes. Thankfully I’ll be able to see a few of my friends that live also live in Toronto or Connecticut or California, but it will be harder to see the ones in Europe. I hate goodbyes but we’ll all be together again in the next few years, I know. My hausmeister came this morning at 7:30 to do a final inspection. It was intimidating, as always, but it all happened so quickly that it didn’t hit me that I was leaving. 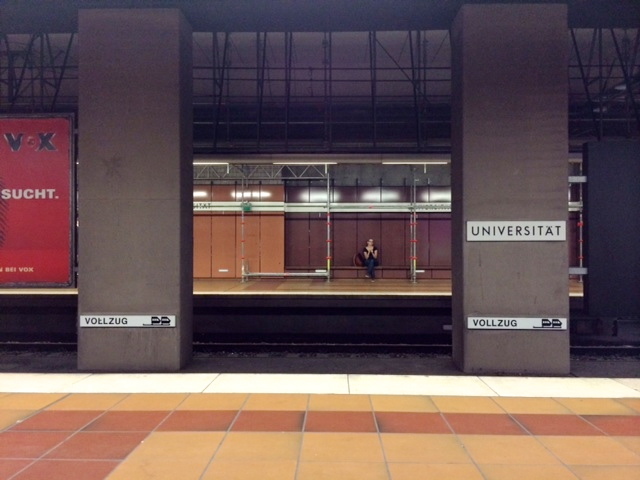 I walked through campus to the s-bahn like I always do (except with about 70 kilos of luggage in tow) without looking over my back once, which feels weird now. I wish I had taken a few more moments to take everything in one more time, but I guess at that point it didn’t really make a difference. I cherished every moment and felt more present than ever. I posted a photo to Instagram every day, starting from day 1 and ending with day 156. I’m so glad I did, because it helped me find something beautiful or meaningful in every day that maybe I wouldn’t have noticed otherwise. It’s helped me remember every day and create a memory of something that maybe I wouldn’t have remembered otherwise. This blog has certainly helped, too. There’s only an hour and 45 minutes left of this flight and the only thing I want is for this plane to turn around and go back to where it started. When I told my parents about some schoolwork I was doing at one point they were surprised and said, "there’s work to do at summer camp?" I’ll reluctantly admit that they were right, it was kind of like summer camp. Our dorms were all arranged in a similar manner as to how the cabins were arranged at the summer camp I went to in New Hampshire for 4 years when I was younger. There was no lake, but there was a schwimmbad 25 minutes away by walking with a 2.00 euro entry fee, equipped with a high-dive and water slide. The food was pretty similar to what I ate at summer camp, located at the “mensa”, which was extremely cheap and the food tasted like it should, for how cheap it was. But I loved summer camp, and this whole experience was 10 folds better. I lived in a different dorm style, but all my friends were less than a 15-minute walk away and we saw each other almost everyday. School was also a 15-minute walk away, and classes had no attendance or “homework”. I went to at least 2 different countries and 4 different cities every month, so with all this considered, I think it’s understandable why I don’t have much of a desire to return home or go back to Toronto. But then I think about my best friends at home that I haven’t seen in forever, my dog, my parents, homemade food, my best friends in Toronto, and I become more hopeful. I am truly very excited for what’s in store at home the next 3 weeks and what this year at Ryerson will bring, but that’s not to say that there won’t be a day that I won’t long to be back in Stuttgart. After the Settler’s game finished last night we all started reminiscing again and came to the realization that the kitchen we were sitting in was where we all became friends on our second night in Stuttgart. We all remember it so clearly, and how that night (as dramatic as it sounds) changed the way our semester would pan out. We all became close almost instantly, and went on our first trip together to Prague just a month after we met. We all got along so well and had so, so much fun together. The 4 of us from Toronto knew each other before coming to Stuttgart but considered each other as more of acquaintances and had probably only talked a few times. Another reason I’m so thankful for this experience was the opportunity to befriend people I probably wouldn’t have otherwise. Our program often feels very clique-y, especially considering people sit in the same seats during every lecture, with the same people. The only opportunity you have to meet new people is in your classes or labs, but that is rare, since at this point everyone has a group of friends that they’re comfortable with. That being said, I am so happy I got the opportunity to get as close as we did with the other students from Ryerson, and happy that I get to see them all in less than a month. In all 156 days I went to 11 countries (Germany, Ireland, England, Czech Republic, France, Spain, Italy, Denmark, Sweden, Hungary, and Croatia), saw over 20 cities, and took 7 classes (Mobile Content, Mobile App Development, Innovation Management, IT Security, Environmental Management, UI Design, and Current Aspects of Packaging). I learned from every class, every city, every country, and every new person I encountered. I learned so much about Germany, Europe as a whole, and its different cultures. I learned a bit of German (3-week intensive course only went so far…) and at the end of it understood most of what I read and heard just in everyday life (but anyone could probably do that). The first step in going to Germany was learning that it’s called Deutschland in German, which I’m amazed I didn’t know before and I want to slap myself for that. I’ve made baby steps and even strides in more common knowledge than what I learned at school, but I did also learn some valuable information in my classes. I’m so happy I had the opportunity to take different classes than what I would have at Ryerson. I learned acceptance, patience, and how much it means to be thankful for everyday. I learned how to travel “better” or “properly” – thinking back to my first trip to Dublin and London is hilarious because of how much of a catastrophe it was. I’m so glad I went because it was an amazing trip spent with 3 close friends from Toronto, but I definitely would have planned my travels there and back a bit better if it was now. But at least it's still a good story. After 5 months I have lots of stories, stories that I’ll remember forever and that I’ll never let go. People tend to ask me or each other what their favorite city was in Europe, but does there really need to be a favorite? Every trip I took was different and special in its own way, but if I had to choose a favorite city, it would be Stuttgart. The way of life just makes sense to me; materialism is nowhere near as monumental as it is in Canada or the US and its almost rare to see people transfixed on the smartphones for long periods of time. On the s-bahns people mostly keep to themselves like they do in New York, but we did meet some pretty nice people throughout all those rides. People are far more polite; even children, as we noticed at the schwimmbad. So many kids would jump on top of us but they would always say sorry afterwards. I wrote a post previously about why Germany/Europe is “better” (I’m sorry if you disagree) and I still stand by those points. My goal is to move back here hopefully shortly after I graduate next spring for either a masters or if I’m lucky enough, a job. Hopefully in France, but that’s a big hopefully. There’s 45 minutes left of this plane ride and I feel better after writing this all out. I'll probably do one more post after a few days at home.